Introduction of AJAX Control Toolkit has opened many interesting possibilities for developing rich UI in ASP.NET. Add an awesome IDE like Visual Studio to it, and you can get astounding results without doing much. In this article we will see how to enhance client side validators using AJAX Control Toolkit. Given below are screen shots of what we are trying to achieve. The whole purpose is to improve user experience with very little effort. Run it by following the instructions in 'readme.txt' file of downloaded archive. 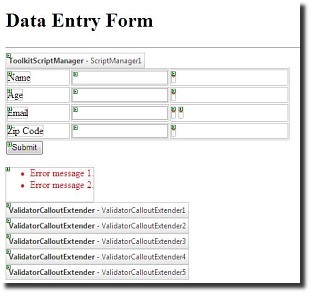 A simple ASP.NET Form (click for larger view). As you can see, it looks like any other form you might design with ASP.NET. It has few input boxes, and labels corresponding to them. I have added some validators for each textbox. Name, email are made mandatory using 'RequiredFieldValidator'. Age must be between 18-100, which is validated by 'RangeValidator'. There are 'RegularExpressionValidator's for email and Fax numbers. And yes, we have a 'Submit' button too! A simple ASP.NET page. First we place a 'ValidationSummary' control on the page. So all our errors can be shown in one place. This will be useful to implement the modal dialog in next section. Notice that I have set the 'Text' property of validators to '*', since we want the actual error message to be shown on the validation summary. Callouts were accomplished using the 'ValidatorCalloutExtender' from AJAX Control Toolkit. Just drag and drop a 'ValidatorCalloutExtender' onto the screen from toolbox. Set the 'TargetControlID' of this extender to the ID of our validator. I have five validators on my page, so I used equal number for 'ValidatorCalloutExtender'. One for each validator. Modify 'TargetControlID' of each extender to point to a validator. 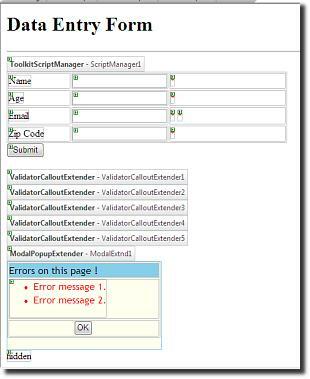 After adding validation summary and ValidatorCalloutExtenders (click for larger view). Incredibly, that is all which is need to get those nice callouts. 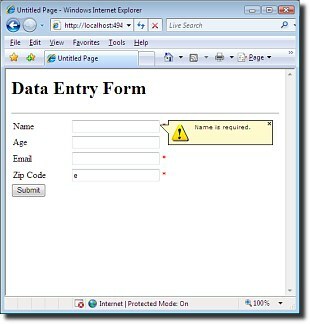 Run your page and click submit without entering anything in the form. You should see those callouts. 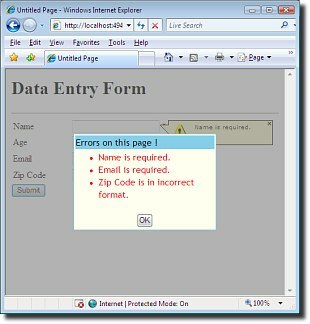 Try entering wrong information in any of the textboxes, a callout will magically appear near it, showing the error message of the validator that failed. The best part of our modal dialog box is that it disables the parent/window completely. It adds a translucent layer over the background which makes it look really neat. Here again, the AJAX Control Toolkit comes to our help. The 'ModalPopupExtender' is excatly meant to do such things. Just drag and drop one the screen. After that we create a DIV that will act as popup window for us. The markup for the div is given below. We have set 'PopupControlID' property of ModalPopupExtender, to 'SummaryDiv' which is actually the id of the <div> we just created. The 'TargetControlID' property of ModalPopupExtender, just needs to be set to something. In our case we will set it to point to a hidden label. This is because want to supress default show/hide functionality of this extender. Our <div> consists of a HTML button, on clicking of which the modal dialog box is hidden. Also note that we have moved the validation summary inside our <div> tag. Form after addition of ModalPopupExtender and the <div>(click for larger view). Let us now see the CSS for our example. Now just run the example. Enter some junk data, you should see the modal dialog box. Run the example again. This time the <div> does not flash when the page loads. Impressed ? show it to your boss too ! 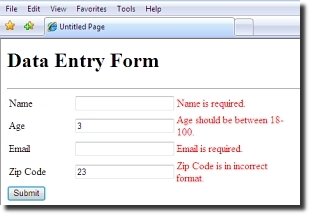 Using this approach you should be easily able to add more gloss to your old ASP.NET webforms. Any suggestions , views and criticsm are always welcomed.